Malawi “The warm heart of Africa” Part 1😜 – Crickey…….we're in Africa! Our first experience of Malawi was so good, the country has quite a large population but is geographically quite a small country so there was so much to look at as we drove along. We stopped and bought bananas, mangos and a whole bucket of raw peanuts from road side stalls. The farming is intensive and all done by hand and you could see how hard working the Malawi people were. Going through the villages was another great experience with the hustle and bustle of trading and transport. The only bad point was the extent of litter I presume because they just don’t have the infrastructure in the way of rubbish tips in place. There was a huge amount of blue plastic bags everywhere and one local we spoke to said that it was nicknamed Malawi’s National Flower! The people of Malawi were definitely the most friendly that we have encountered so far and we feel very welcome and safe anywhere. That night we stayed at an interesting camp site in a town called Dedza. It was situated at the back of a working pottery factory which also had a restaurant and bar. They made beautiful pottery and Pauline and I bought a coffee mug each, Paulines a Zebra one and mine was a Malawi one. We also met a couple who were born and bred in Malawi but now lived in Birmingham, England and really enjoyed a chat with them. The further North we get now the less travellers we are seeing and the less touristy it is becoming. We have been told that the real Africa would start for us from Zambia and beyond and it’s ringing true. Our next stop in Malawi was the Liwonde National Park where we stayed at Mvuu Camp which is inside the park and was a beautiful place to stay for three nights. The park has a Rhinoceros sanctuary inside it but access is restricted to the main road going through the sanctuary so we unfortunately didn’t see any. The entrance to the Rhino Sanctuary. The river flats were full of animals and birds. Can you spot the helicopter? We also saw a lot of elephants including a family of 35 with lots of calves who crossed the road right in front of us. 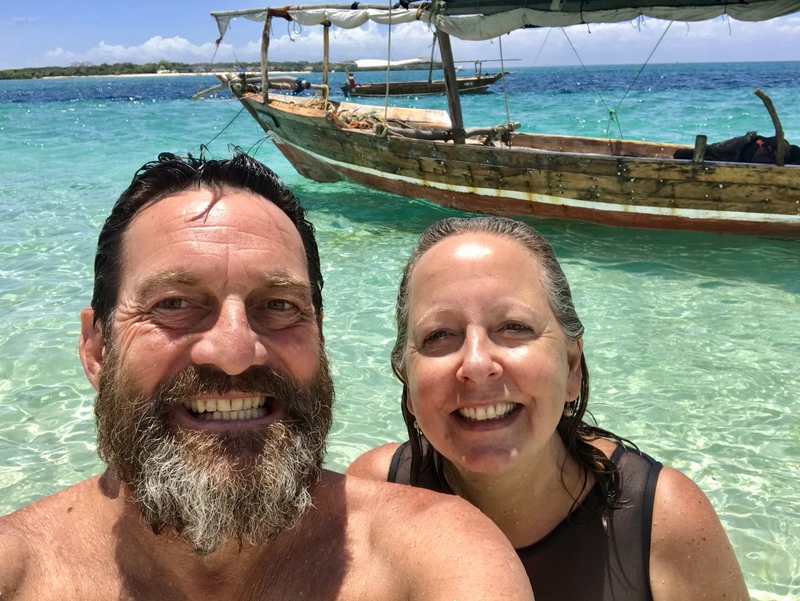 We had been quite excited to get to Lake Malawi because it would be where we could do some boating, snorkelling and swimming and just chill. We stayed right on the beach and I mean that literally at a place called Mufasa Eco Lodge which is basically a backpackers place but has a few camp spots on the beach. Our campsite on the beach. Our campsite from the water! We stayed for three nights and were the only campers and only a handful of backpackers came through in that town. One of our days was spent on a local boat having a look at the harbour of Monkey Bay, some islands off Monkey Bay and doing some fishing and feeding some of the small fish we caught to some African Fish Eagles which made for some great photos. The African Fish Eagle swooping down for a fish. About you pounce and eyes on the prize. A couple of beautiful old ships that should be restored. The boat even had my initials on it! We also asked if we could stop at a local village and go ashore to have a look. We walked around the village followed by a large group of small excited children and right up the back visited the school and were invited in to one of the classrooms to ask the children some questions. They were delightful and were very keen to talk to us but it was quite mind boggling to see how many children were in one classroom. This was a class room of around 45 children in grade 6 and they were really crammed in working on a science subject about pollination but they were all very happy and polite. One of our questions was what their favourite subject was and it was Maths by a long way! Sport consisted of soccer for the boys and netball for the girls but goal posts for both were very rudimentary and balls were well worn and past there best. The children had also been planting and maintaining about 30 Eucalyptus trees for shade in the playground and it was so nice to smell that gum tree smell. This is a fishing village and a few crops are grown but it is difficult because of the sandy soil so some of the fish they catch are dried on racks and then traded for fruit and vegetables etc. A classroom full of great children. Two young girls fetching water. We went out on a second boat trip from Cape McClear the next day and did some great snorkelling and exploring. The boat was skippered by Ben and his brother Aubrey was back in Malawi on holidays so he came with us too. Aubrey has lived in Hobart for the last seven years after marrying an Aussie girl who spent time volunteering in Monkey Bay. They have a four year old son but unfortunately have since split up but Aubrey wanted to stay on in Hobart to be close to his son. Funnily this was the first time that he had been back to Malawi in the seven years yet his wife comes back with the son to visit family regularly! We had a great day with these blokes and they were a lot of fun. Lots of snorkelling, swimming and Fish Eagle feeding again. Brothers Aubrey on the left and Ben had not seen each other for seven years. A battle between a Fish Eagle and a Hammerhead Bird for a fish! You can see the fish that is about to be grabbed. There were loads of very colourful fish for our snorkelling. Malawi “The warm heart of Africa” Part 2 to follow! You guys are certainly seeing a lot of interesting things. Love reading your blog. Thanks Lyndon, I just found two of your comments in the Spam folder for some reason. I love the photos particularly of the kids at school, they have beautiful faces and I am thrilled that through your big birthday we will contribute some new soccer gear. I’m looking forward to your next blog and am really enjoying your adventures. As you get further from the touristy areas do you feel the remoteness? Take good care both of you. The school was a very special visit indeed. See you soon. I am enjoying your trip so much! The classrooms in Rwanda were equally crowded in the secondary schools I visited. The kids were studying for their Year 12 IB – higher qual than our VCE but without textbooks- sometimes not even for the teacher. One physics teacher asked me if I could source a book on a particular topic back in Oz. I did, but it came from Monash Uni- a first year topic not year 12 here. Thanks Sue, we are looking forward to visiting Rwanda when we return in the new year. We loved the Fish Eagles and Lake Malawi was a favourite spot. Previous South Luangwa National Park in Zambia. Next Malawi “The Warm Heart of Africa” Part 2.